Glenn Beck is still ranting about a speech from Stephen Lerner, an ex-union official that conveyed a strategy to force banks to lower mortgage payments for people struggling to stay in their homes. Previously the hypocrisy of Beck's concern was addressed here. Lerner's strategy is reprinted here with permission. Last night, commentator Lawrence O'Donnell explained why the FBI is ignoring Beck's phone calls on his MSNBC show, The Last Word. The FBI is ignoring Beck because he is an ignorant blowhard. More often than not, he doesn't know what he's ranting about. That makes at least three good reasons why Beck should be ignored by all reasonable people of any political orientation: radical, liberal, conservative or reactionary (libertarian). The second reason is that Beck is a hypocrite as previously mentioned here, but that example was the 19th of 22 examples of hypocrisy on Glenn Beck's part documented on this Review during the course of the last year! So who listens to and follows a liar, a hypocrite and an ignorant blowhard? Sadly, Beck has millions of followers who are convinced by Beck's gift for propaganda. One of the elements of this propaganda is to repeat a lie over and over and over until listeners believe it, and the biggest lie Beck tells his gullible flock is that he tells the truth. Just as friends don't let friends drive drunk, don't let your friends, relatives and others on your e-mail and Facebook lists of friends tune into Beck without first warning them about the real Beck: dishonest and ignorant blowhard with a knack for demonstrating hypocrisy. 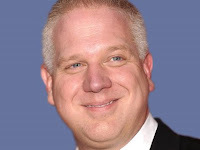 Please, share this URL about Glenn Beck: sharethisurlaboutglennbeck.com. Just because he's leaving his Fox stage later this year doesn't mean that he will no longer be a threat to people's understanding about our world. Mike Lennox conveys how all of Beck's supporters are dealing with this blatant lie that Beck told in February. They attack me or this blog and will not address this blatant lie in order to avoid the cognitive dissonance that will accompany the realization that Beck is a bald-faced liar. iwonder how the FBI is handling your calls about the death threats? Can you up date us on that? Todd, no I can't. They do not get back to me. Todd, the FBI ignores the ignorant blowhard. How come you are his chief online defender?